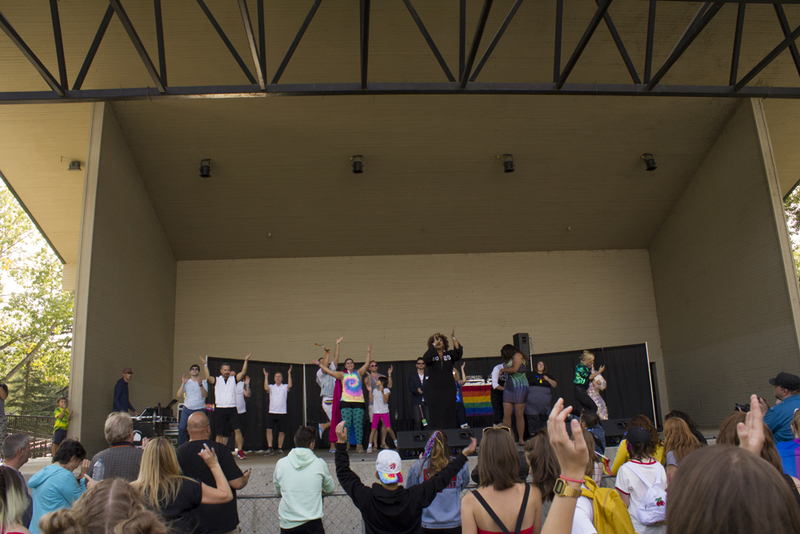 We always look forward to providing sound for Calgary Pride, and amplifying the voices of those amazing people who make this city great. 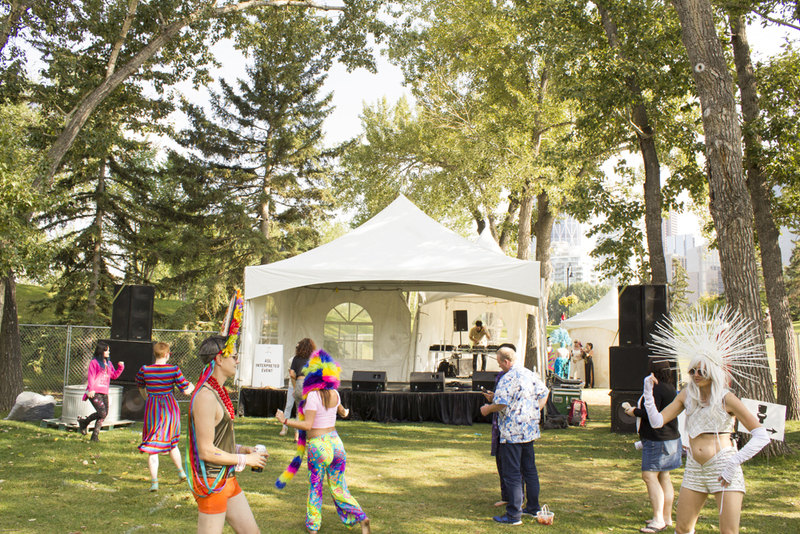 We provided audiovisual for various Calgary Pride events all week, leading up to the day of the parade and Calgary Pride in the Park on Prince’s Island. 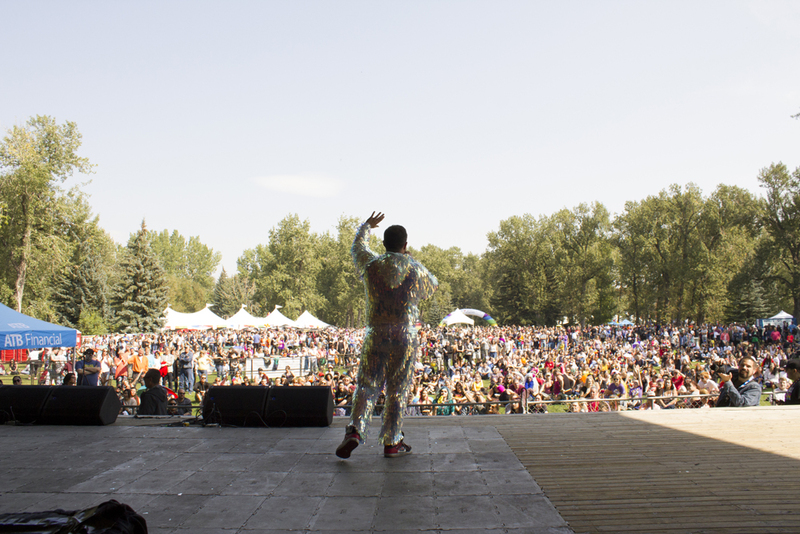 James Demers, emcee for Calgary Pride 2018, shined in everything he wore – but we thought the the disco-ball outfit was especially creative. 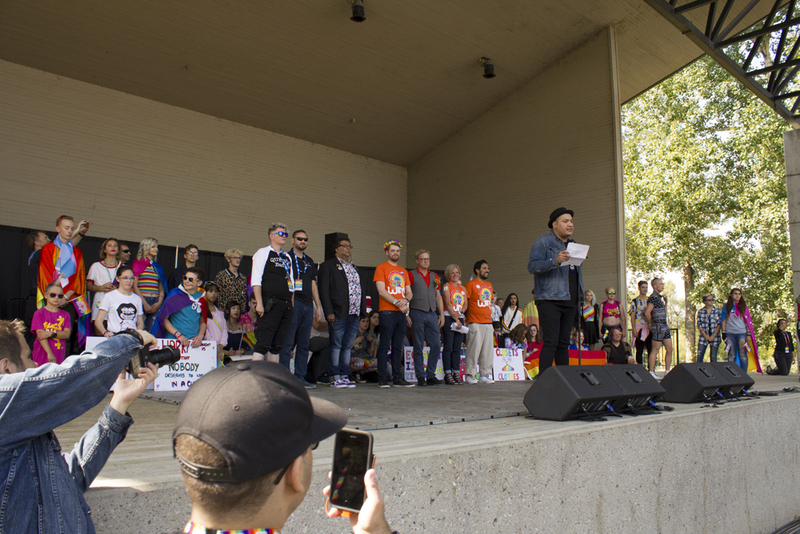 Evans Yellow Old Woman, from Siksika Nation, led the speeches with a land acknowledgement as students in Calgary’s Gay Straight Alliance took the stage behind him. 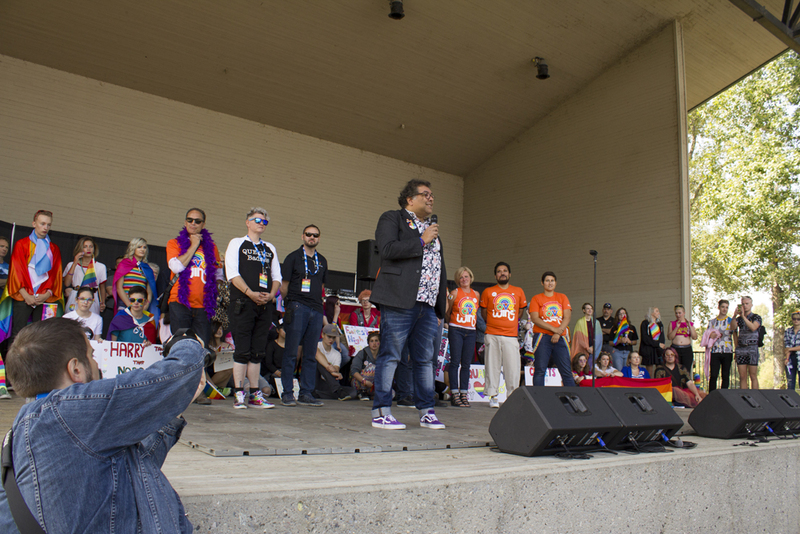 Politicians like Calgary Mayor Naheed Nenshi (front) and Alberta Premier Rachel Notley (third from the right in the orange shirt), were present to support Calgary Pride – particularly commending the strength, courage, and passion from everyone involved. 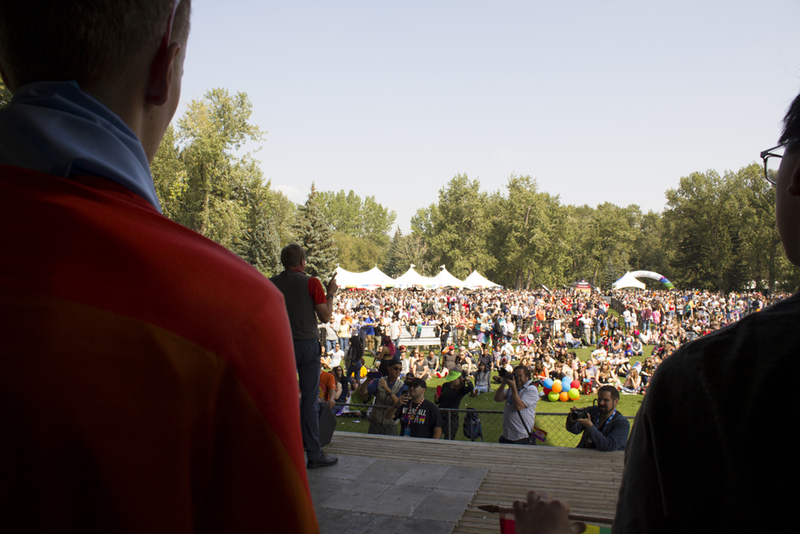 David Egress, parade marshall for the Calgary Pride and Alberta’s Minister of Education, gave an uplifting and compassionate speech from the front of the stage. 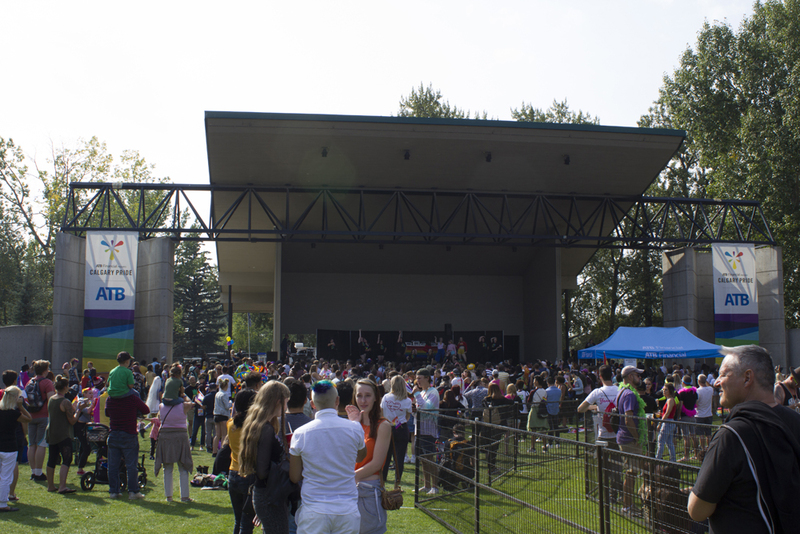 To fill the sound of the whole main stage area, we brought in six Nexo line array speakers, suspended behind the Pride banners on either side of the stage. We also brought in four subwoofers in the concrete U behind the banners. 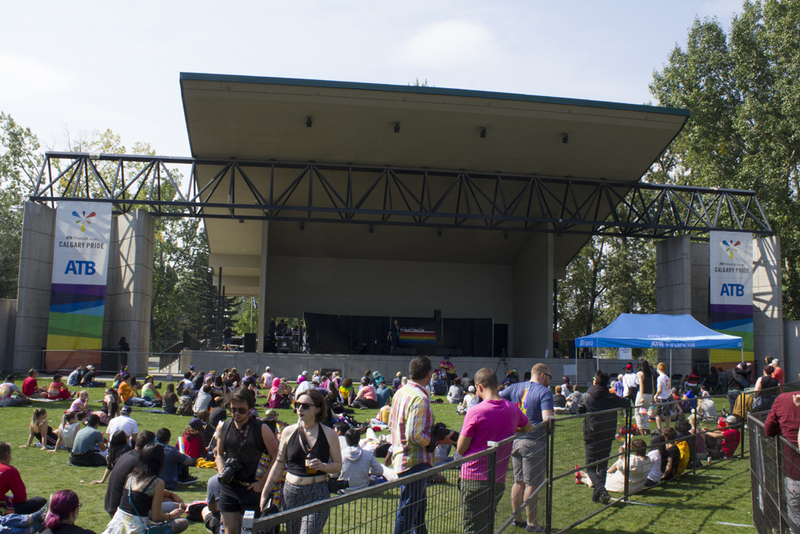 The subwoofers were angled in such a way that the concrete U-shape resonated the low-end of the performance all throughout the main stage area. 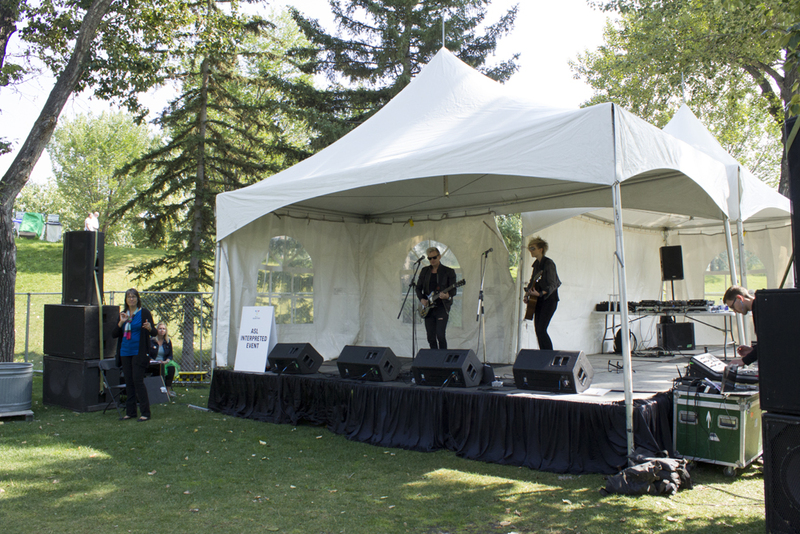 As many international superstars took the stage, we were particularly honoured to work with a childhood idol and four-time Juno award winner, Simone Denny. 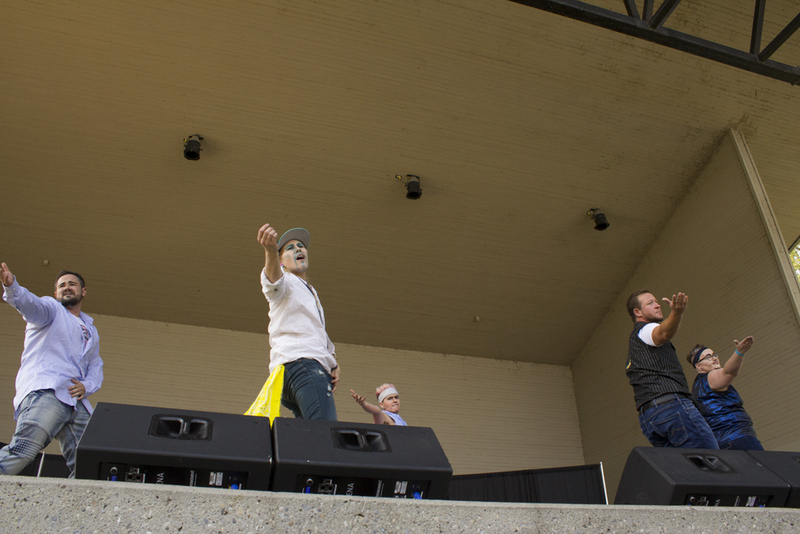 Fake Mustache troupe, which included Jeremy Demers, danced to an amazing mix of tunes. 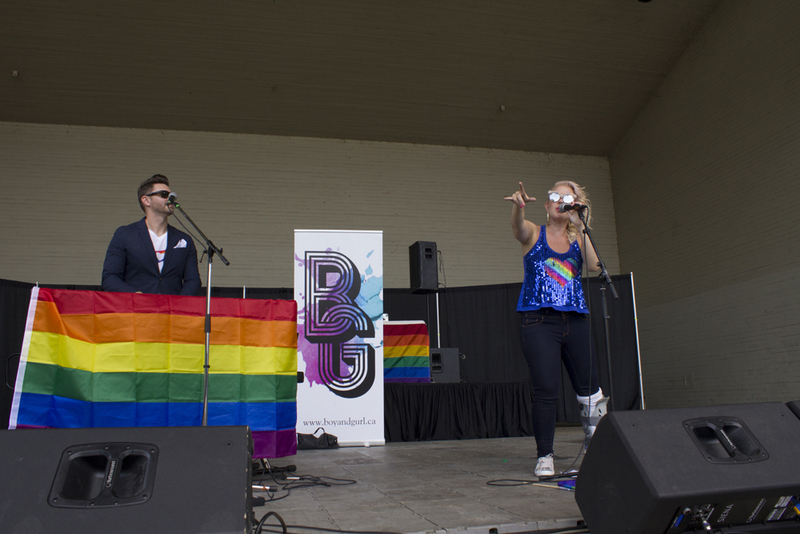 Pop duo Boy&GurL rocked the main stage, and Crystal McGrath kept the people dancing – even when her own leg was in a cast. 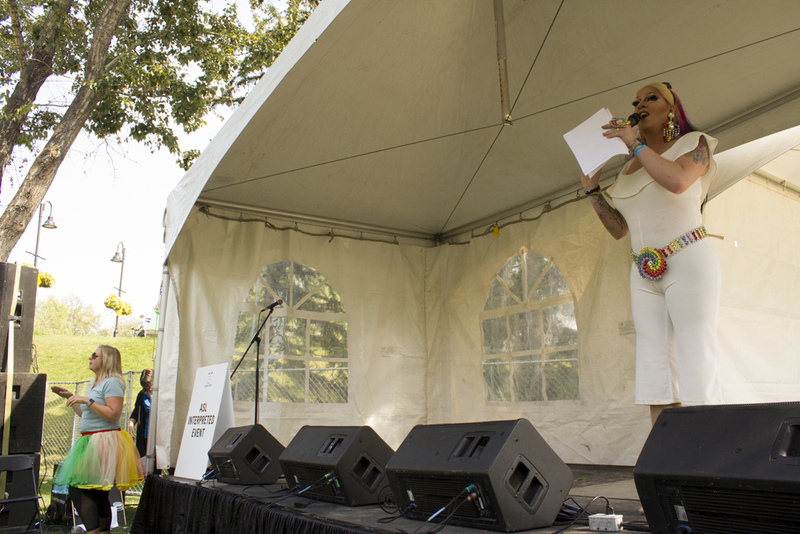 The Pride Lounge was a chill and relaxing performance zone, about half a kilometre from the main stage. 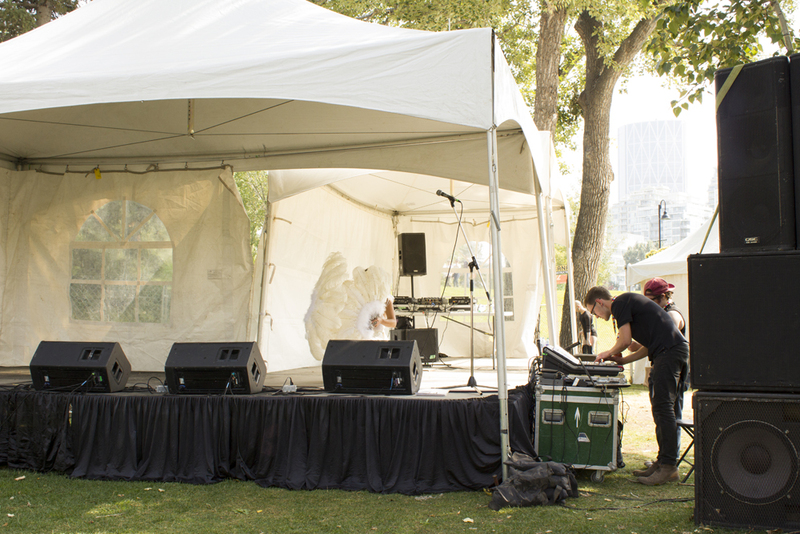 This performance area for adults featured DJs and singer-songwriters, as they played for an audience enjoying the show on the hillside. 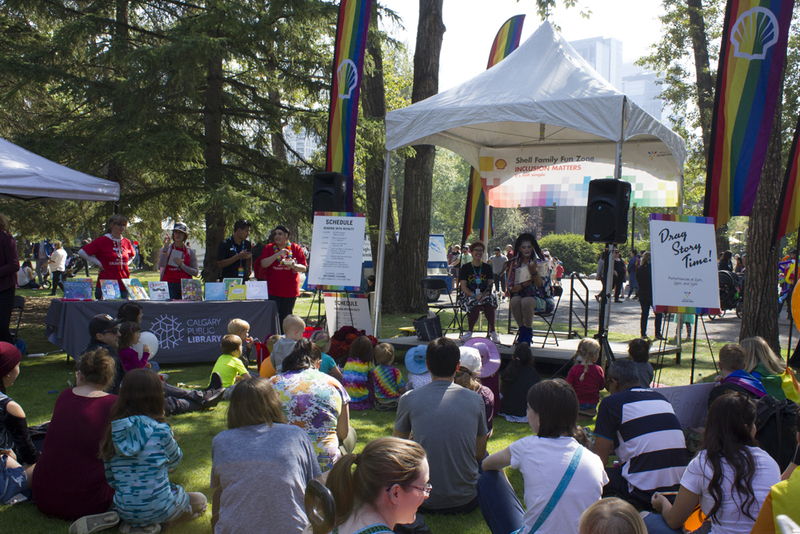 Calgary Pride organizers brought in a sign language translator to ensure accessibility for those with limited hearing at the Pride Lounge. Amy Hef kept a full-bodied sound, even just with two members. 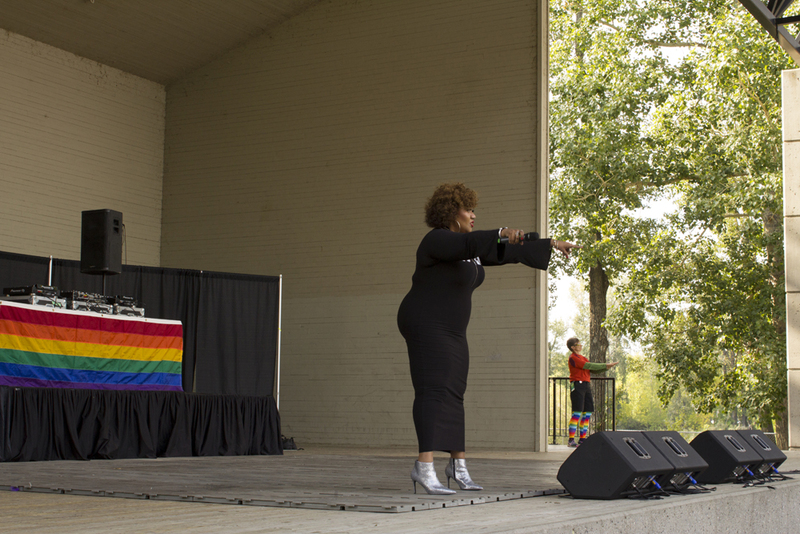 To help bring out these kinds of performances, we stacked two subwoofers on either side of the stage and strapped two three-way speakers on the subs. 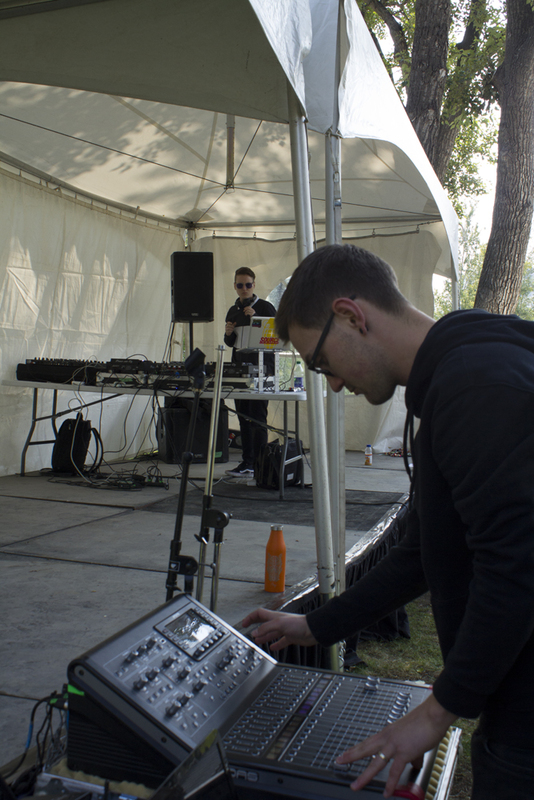 Even the DJs got their own subwoofer to hear their low end of the mix right, as shown with Andrew, from Calgary Show Services, mixing for DJ Dopamine. 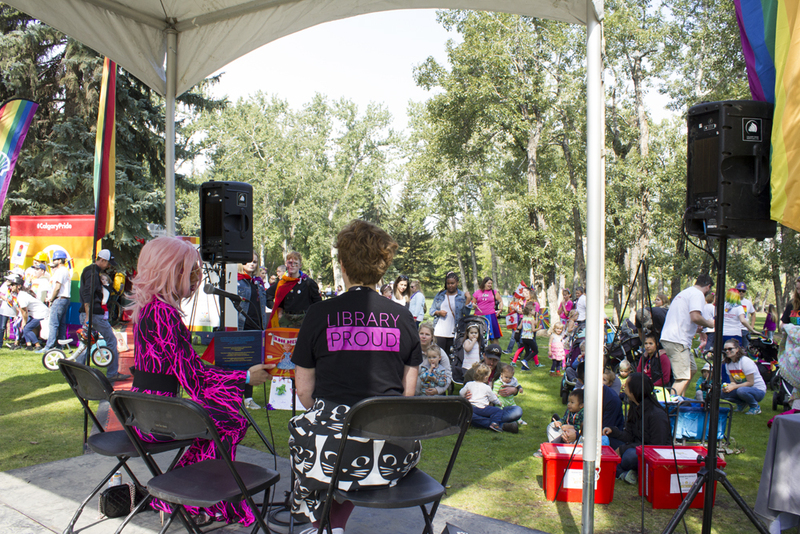 Finally, we also supported the Calgary Public Library’s stage, with hourly Reading with Royalty events featuring drag queens and kings reading illustrated children’s books to families. 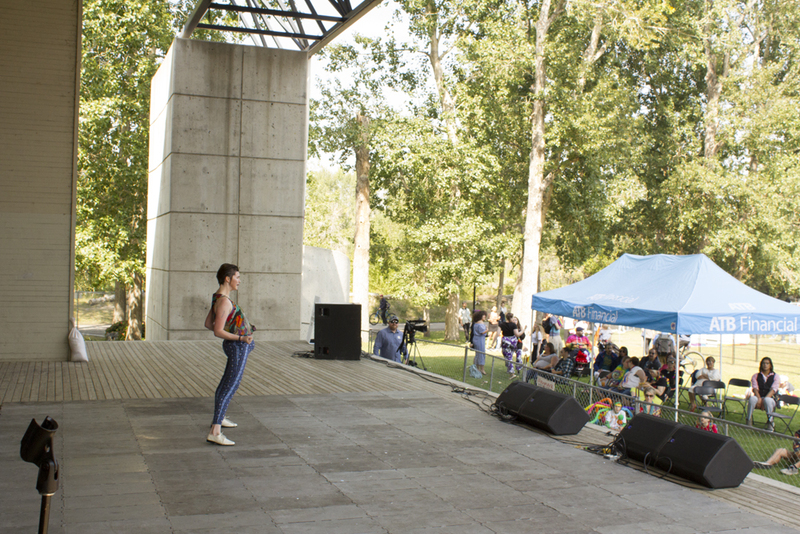 This stage was the easiest to mix, as we just had to ensure the single microphone was loud and clear, and also that the volume wasn’t loud enough to damage the eardrums of any young attendants. 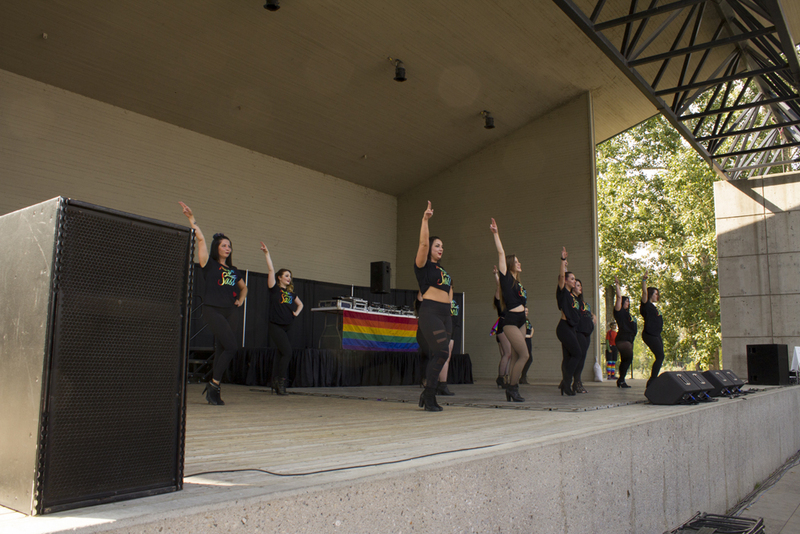 This is the fifth year we’ve helped set up for the Calgary Pride main performances, and we really brought a strong sound this year. 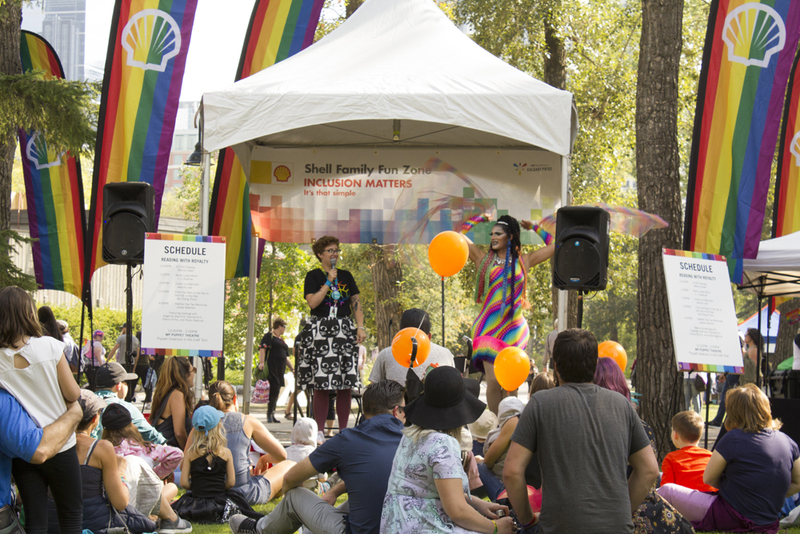 While we’ve had a busy season since, we especially wanted to make sure we could feature this year’s event with Calgary Pride.